Long Man of Wilmington01273 486260work Historic SiteUntil recently the earliest record of Europe’s largest representation of the human form was in a drawing made by William Burrell when he visited Wilmington Priory, nestling under the steep slopes of Windover Hill, home of the 235 feet high Wilmington Giant. 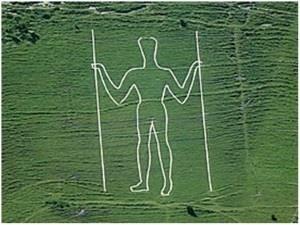 In 1993, however, a new drawing of the Long Man was discovered, made by surveyor, John Rowley, in 1710. The new drawing has confirmed some theories and dispelled others. It suggests that the original figure was a shadow or indentation in the grass rather than a solid line; there were facial features that are no longer visible; the staffs being held were not a rake and a scythe as once described and the head was once a distinctive helmet shape, giving credence to the idea of the figure as a helmeted war-god. Until the 19th century the Long Man was only visible in certain light conditions and after a light fall of snow, but in 1874, it was marked out in yellow bricks. It is claimed that during this restoration, the feet were incorrectly positioned, but, despite popular local legend, there is no evidence, historical or archaeological, to suggest that prudish Victorians robbed the Giant of his manhood! In 1925, the site of the Long Man was given to the Sussex Archaeological Trust (now the Sussex Archaeological Society) by the Duke of Devonshire. During World War II, the figure was painted green to prevent enemy aviators using it as a landmark. In 1969, further restoration took place and the bricks were replaced with pre-cast concrete blocks that are now regularly painted to keep the Long Man visible from many miles away. The terracettes, horizontal ripples in the turf, change constantly as the soil is rolled downhill by weathering and animal activity. The lack of firm historical evidence still leaves many theories abounding about his history. Many Sussex people are convinced that he is prehistoric, other believe that he is the work of an artistic monk from the nearby Priory between the 11th and 15th centuries. Roman coins bearing a similar figure suggest that he belonged to the 4th century AD and there may be plausible parallels with a helmeted figure found on Anglo-Saxon ornaments. Until recently the earliest record of Europe’s largest representation of the human form was in a drawing made by William Burrell when he visited Wilmington Priory, nestling under the steep slopes of Windover Hill, home of the 235 feet high Wilmington Giant. In 1993, however, a new drawing of the Long Man was discovered, made by surveyor, John Rowley, in 1710. The Long Man of Wilmington is situated 6 miles north-west of Eastbourne (OS 199 TQ543034). It is signposted from the A27, 2 miles west of the junction with the A22 at Polegate and 10 miles east of Lewes and located south of the village of Wilmington. Buses serve the A27, and British Rail stations served direct from Eastbourne, Lewes, Hastings and London are at Berwick (3 miles) and Polegate (2.5 miles). Please check local timetables for details.